Why is the answer to this question so complicated? Because the response to an allowability question involves applying a part of the federal rules known as the cost principles. That title was chosen for a reason — these are general principles to be applied to the facts and circumstances surrounding individual financial transactions. The federal rules also say that recipients and subrecipients must have written procedures for determining the allowability of costs under Subpart E of 2 CFR 200. This is the regulatory location for the consolidated cost policies that now apply to recipients and subrecipients across the board — governments, institutions of higher education, nonprofit organizations. What the rules don’t say, however, is what the written procedures should look like. What federal awards do they apply to? How are direct and indirect costs distinguished? What is a cost policy statement, and how is it used? How do the feds define cost reasonableness? What are the levels of cost allocability? Why were the “selected items of cost” selected? Are there best practices for interpreting the principles? 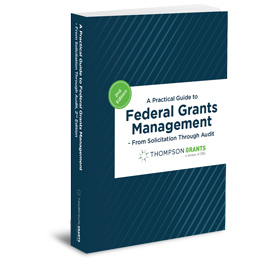 What is the allowability of “big ticket” items in your grant budgets? What kinds of “nickel and dime” expenses can cause trouble? What role do our own organizational policies play in cost allowability? What costs are subject to “prior approval” or “advance understandings”? This overview of the cost principles will enable program staffers to join the team to prevent cost mischarging and potential disallowances. Sign up today. Bob Lloyd, Principal of Federal Fund Management Advisor™ — a respected authority on policies and practices affecting the award, administration, and oversight of federal awards — will conduct this practical “how-to” program aimed at ensuring successful cost-charging.